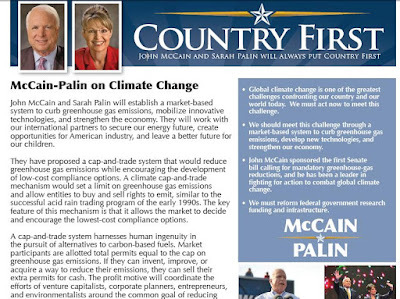 I see Sarah Palin has written "The 'Cap And Tax' Dead End," a Washington Post op-ed denouncing cap-and-trade. Yeah, that heartbeat-away thing sure would have been interesting. Her new plan, if I read it correctly, is that all we have to do to protect the environment is use lots and lots of Alaskan natural gas, and, oh, maybe a little of that clean coal, and some nuclear power, and Americans will be happy and prosperous and carbon emissions will just magically go away. Thanks for that penetrating analysis, Sarah. It's really helpful. May I offer a prediction here? Sarah Palin has now written the first major-media op-ed of her new life. I predict there won't be a second one anytime soon. She'll book twenty mainstream-media interviews based on this (and, incidentally, use the phrase "hungry markets" in every one of them, as she does in the op-ed, and as she did repeatedly on the campaign trail last fall). She'll dine out on this op-ed for weeks. See? I'm a serious person! But she's now exhausted the list of serious issues on which she has ever pretended to have even the slightest expertise (the list is: 1. energy; 2. er, um ...) -- oh, unless Barack Obama somehow proposes responding to a famine somewhere by giving the starving people Down's Syndrome babies to eat. Since her sudden resignation from the Alaskan governor’s office on July 3, Sarah Palin has created a constitutional crisis that could cost state legislators hundreds of thousands of dollars in taxpayers' money to resolve. Palin appointed Lt. Governor Sean Parnell to succeed her, and tapped Lt. Gen. Craig Campbell, the commissioner of the Alaskan Department of Military and Veterans Affairs, to fill Parnell’s post. However, the state legislature had already chosen someone to succeed Parnell in case of an emergency: State Corrections Commissioner Joe Schmidt. To resolve the conflict Palin created, the legislature will almost certainly have to call a special session, an event that could require at least $200,000 to administer. Did she create a wholly unnecessary succession problem simply for the sheer adrenaline rush of getting to tip over the table? Or did she simply not know that a successor was already in place? In her own government? ...legislators said they would also use the special session to recover $29 million in federal stimulus grants Palin rejected in May.... Now that Palin is on her way out, a bipartisan consensus seems to have emerged on retrieving the funding, which would enable the state to fulfill weatherization and energy-efficiency priorities. But ... but energy efficiency comes from selling Alaskan natural gas to hungry markets! Right? Er, $15 million? No. No way. That was Bill Clinton's advance. He'd been president of the United States. That was what Clinton was paid for world rights to his book; he was a global superstar, something even Palin's biggest fans can't claim she is. She got a nice seven-figure deal, and her book will sell, but there's no way she got $15 mil.